The cleanup effort in New York City is grinding along slowly, but a National Guard unit from Ohio experienced a major setback when one of its drivers accidentally ran over an elderly pedestrian on Canal Street. Time reporter Sam Gustin tweeted that the truck's 22-year-old driver told him the 82-year-old victim just ran out in front of his truck without looking. 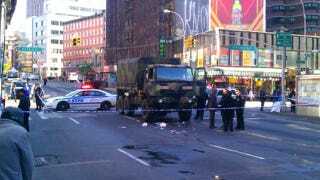 "Nobody looks left or right before crossing the street here," the young soldier said. Someone watching from the sidelines refuted the soldier's claim, and said he had raced to try and make a light. The old man, who was carrying groceries across Canal Street, had unfortunately crossed paths with a six-truck convoy carrying Hurricane Sandy relief supplies. He died shortly after the accident. I used to drive an ambulance, and the emergency vehicle operator course instructors told us that racing to make a light is a bad way to provide patient care. If you hit someone, you've merely created another victim, which kind of defeats the point of trying to save lives. I guess the same applies for relief truck drivers. Slow down, gents! It's good that the mess is getting cleaned up, but please let's do it safely.